So, how does Fantastic Beasts fit into the Harry Potter franchise exactly? And who the F is Leta Lestrange? Fantastic Beasts and Where To Find them was our main focus in 2016 moving into 2017. And for all you die-hard Harry Potter fans out there, you were probably delighted when you spotted all the subtle references to the original franchise and the hidden Easter eggs. But, for those of you who may have missed it… here’s a helpful lowdown. It seems that JK Rowling and the film team were keen to get us prepared for Newt’s world far before we even knew it was actually a thing. Fantastic Beasts and Where To Find Them made an appearance back in 1997 when Harry Potter and the Philosopher’s Stone book was released. It’s nature was a fictional textbook that Harry has to buy before he starts school and it was written by none other than Newt Scamander and tells the story of him on his adventures. Although Newt himself doesn’t appear in the original films, his footsteps can be seen on the Marauder’s map in Harry Potter and the Prisoner of Azkaban, back in 2004. He is perhaps the main focus of Fantastic Beasts and it seems that he did actually crop up in Harry Potter as well. He’s the seriously dangerous dude in Europe and during the interrogation scene with Newt, he is accused of being one of his followers by Percival Graves. However, Grindelwald is also a key figure in Harry Potter and the Deathly Hallows when he is coined as the most dangerous dark wizard in history… before Voldemort came along, obvs. Why? Well, Grindelwald attempted to lead a wizarding revolution where he tried to overturn the secrecy of wizards as he believed that he should become the ‘benevolent overlord’ of muggles. Naturally, that didn’t go down too well. However, he did manage to kill his opposition and attempted to justify his actions by claiming that it was for the ‘Greater Good’ - a saying that was actually coined by Albus Dumbledore. Grindelwald then went on to pursue the Deathly Hallows, which then became his symbol. You might remember that in Fantastic Beasts, Percival Graves presents Credence with a necklace of the very same symbol, which reminds us of the pendant Xenophilius Lovegood wears in Deathly Hallows. Similarly, no Harry Potter related film or book would be complete without some form of mention of Dumbledore. In the case of Fantastic Beasts, Newt being expelled from Hogwart’s is brought up and he is quickly asked why Dumbledore fought so hard to defend him (he was his transfiguration teacher when Newt was a student). One of Harry Potter’s meanest characters, Bellatrix Lestrange is one of the last Death Eaters to be killed at the Battle of Hogwarts. Leta Estrange is thought to be the Grandmother-In-Law of Bellatrix and is an old friend of Newt’s. Newt and Leta bonded over a mutual love of magical creatures and during her time at Hogwarts, Leta performed an experiment which went wrong and endangered another student. Newt being the cool guy that he is, took the blame for the accident and as such, still has strong feelings for the Lestrange lady. So much so that he carries her photo around in his expanding suitcase. Fear not if we’ve lost you - the director of Fantastic Beasts, David Yates, has said that we will learn more about Leta’s story in the upcoming films. Not only does Graves mention Hogwarts in the interrogation scene, it is later brought up in the apartment of the Goldstein sisters. Tina and Queenie claim that the American wizarding school, Ilvermoney is the best in the world. Obviously, they’re mistaken - it’s Hogwarts… a view that Newt Scamander voices in said scene. Oh, and he carries his Hufflepuff scarf around in his briefcase. The classics feature in Fantastic Beasts; Alohamora! Expelliarmus! Obliviate! Hermione Grainger enters Gringotts as Bellatrix Estrange in Harry Potter and the Dealthy Hallows, yes? Well, the gang soon find out that the vault is guarded by a Ukranian Ironbelly. As such, the young witch encourages Ron and Harry to jump on its back and use it as their escape method. In Fantastic Beasts, however, Newt tells Jacob Kowalski that he worked with the Ukrainian Ironbellies during the First World War. You know those cute yet mischievous creatures, Nifflers? Well, turns out that they made an appearance in Harry’s fourth year Care of Magical Creatures class with Hagrid. Hagrid paired the students with their own Niffler to help them dig for Leprechaun gold. Obviously. Oh and during Dolores Umbridge’s reign as Headmistress of Hogwarts, Lee Jordan lifts a Niffler into her office which in turn, causes mayhem. Newt Scamander however, is kept on edge for most of the film as he is chasing around after his naughty Niffler. It is hard to be too mad at them though when they are SO DAMN CUTE. The good guys in Fantastic Beats visit a bar to try and find out some information about Newt’s missing creatures. There’s a house-elf working behind the bar and we also spotted a few Goblins floating around. But the main Goblin dude in Fantastic Beasts is Gnarlack who is the black market trader who eventually tells them where Newt’s Demiguise is. When Newt meets Mary Lou Barebone, the head of New Salem Philanthropic Society (that’s an anti-wizarding organisation to you and I), she asks, “Are you a seeker?” to which Newt replies, “I’m more of a chaser, really”. Ahhhhh. Quidditch jokes. They’re our favourites. In Fantastic Beasts, an invisible Demiguise eats an apple which to no-maj’s, just looks like it’s floating in mid-air. In Harry Potter, there’s the whole floating lollipop situation. 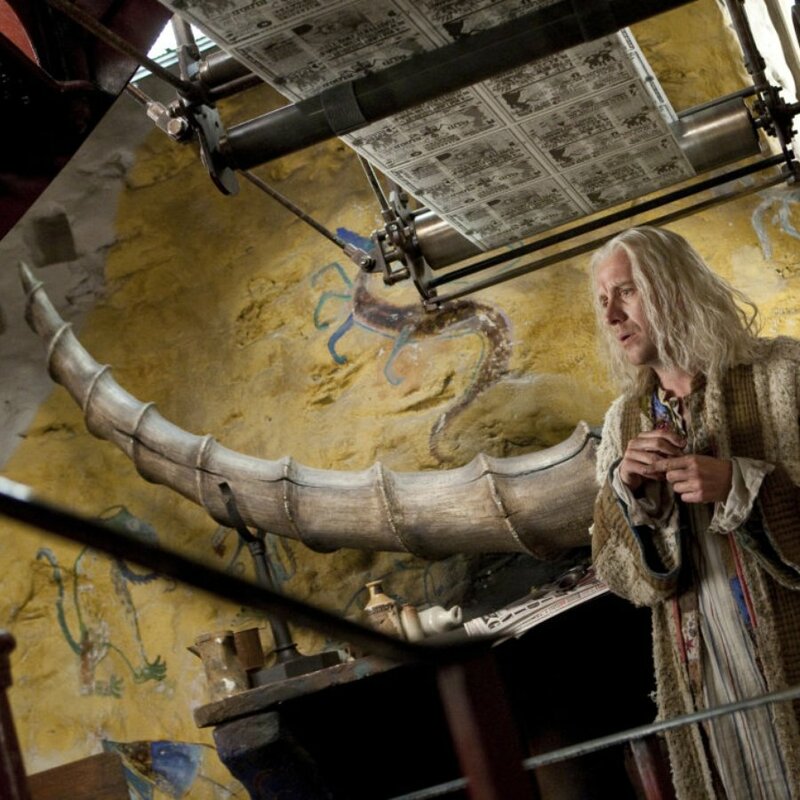 Avid Harry Potter fans will remember that Xenophilius Lovegood’s home was destroyed by an erumpant horn which, for you Muggles out there, is a seriously explosive material. Avoid at all costs. However, he believed that this was the horn of a Crumple-Horned Snorkack. The erumpant is one of Newt’s missing beasts and he goes running into the zoo in search of a breeding mate which, in turn, meant that Newt had to (awkwardly) perform that weird mating dance which made everyone in the cinema a bit unnerved. OH, and one last fun fact. Fantastic Beasts is based in 1926 which is the same year Voldemort was born. That’s it. Capital over and out.